Definition at line 2281 of file DebugInfoMetadata.h. Definition at line 2286 of file DebugInfoMetadata.h. Definition at line 2334 of file DebugInfoMetadata.h. Definition at line 2298 of file DebugInfoMetadata.h. Referenced by llvm::MDNodeKeyImpl< DIGlobalVariable >::isKeyOf(), llvm::MDNodeKeyImpl< DILocalVariable >::isKeyOf(), and rotateSign(). Definition at line 2299 of file DebugInfoMetadata.h. Definition at line 2317 of file DebugInfoMetadata.h. Definition at line 2296 of file DebugInfoMetadata.h. Referenced by llvm::DwarfUnit::addSourceLine(), and rotateSign(). Definition at line 2311 of file DebugInfoMetadata.h. Definition at line 2293 of file DebugInfoMetadata.h. Referenced by llvm::DwarfUnit::addSourceLine(), llvm::MDNodeKeyImpl< DIGlobalVariable >::isKeyOf(), llvm::MDNodeKeyImpl< DILocalVariable >::isKeyOf(), and rotateSign(). Definition at line 2295 of file DebugInfoMetadata.h. Referenced by llvm::DwarfCompileUnit::addLocationAttribute(), llvm::DbgValueHistoryMap::dump(), emitDebugValueComment(), and llvm::DwarfCompileUnit::getOrCreateGlobalVariableDIE(). Definition at line 2331 of file DebugInfoMetadata.h. Referenced by llvm::MDNodeKeyImpl< DIGlobalVariable >::isKeyOf(), and llvm::MDNodeKeyImpl< DILocalVariable >::isKeyOf(). Definition at line 2330 of file DebugInfoMetadata.h. Definition at line 2329 of file DebugInfoMetadata.h. Referenced by getSubprogram(), llvm::MDNodeKeyImpl< DIGlobalVariable >::isKeyOf(), and llvm::MDNodeKeyImpl< DILocalVariable >::isKeyOf(). Definition at line 2332 of file DebugInfoMetadata.h. Definition at line 2294 of file DebugInfoMetadata.h. Referenced by llvm::DwarfCompileUnit::getOrCreateGlobalVariableDIE(), llvm::DILocalVariable::getScope(), and rotateSign(). Return the signedness of this variable's type, or None if this type is neither signed nor unsigned. Definition at line 2305 of file DebugInfoMetadata.h. References getType(), llvm::None, and llvm::TypedDINodeRef< T >::resolve(). 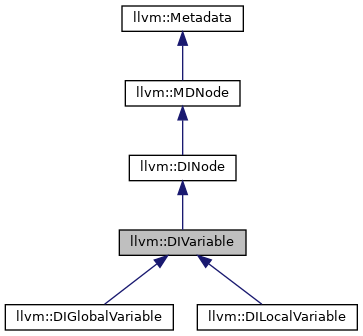 Determines the size of the variable's type. Definition at line 788 of file DebugInfoMetadata.cpp. References assert(), DEFINE_GETIMPL_LOOKUP, DEFINE_GETIMPL_STORE, DEFINE_GETIMPL_STORE_NO_OPS, isCanonical(), Name, llvm::None, llvm::DILocation::Scope, and Size. Referenced by llvm::DbgVariableIntrinsic::getFragmentSizeInBits(), getSubprogram(), and llvm::SelectionDAGBuilder::handleDebugValue(). Definition at line 2323 of file DebugInfoMetadata.h. Definition at line 2297 of file DebugInfoMetadata.h. Referenced by llvm::DwarfCompileUnit::getOrCreateGlobalVariableDIE(), and rotateSign().